9579 - These exquisitely designed purple votives feature a romantic white overlay that will offer a soft glow on any tablescape. W 6.4 x L 6.4 x H 6.8 cm. Glass, White Plaster. 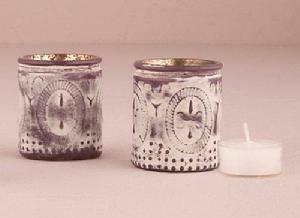 Use in conjunction with flameless battery operated tealights for a worry-free glow. Candles sold separately.